I have a clear distinct memory from when I was about 5 years old and living with my grandparents. They used to “babysit” me during the week whilst Madam Mummy went to work and Big Sis went to school. I would live with them during the weekdays and return home to Madam Mummy and Big Sis on the weekends. Those were great years as I think I was pretty spoilt by them and could potentially get away with murder. Potentially. I have never tested out that theory. Anyway, back to my story. There was one day when I followed my grandparents out to the local kopitiam (literally translated as coffee shop) with their friends for coffee. 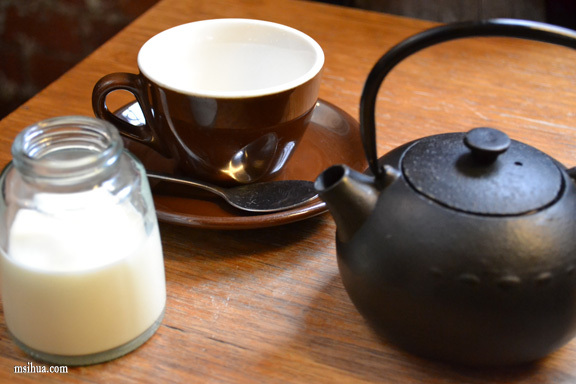 Being only very little, I wasn’t allowed to drink any tea or coffee, but was instead offered choices of Milo or Horlicks. I of course, totally oblivious to the on-goings and cunning-ness of the adults around me, happily sipped my sweet black coffee and fell in love. From that day onwards, I have always had an attachment to coffee. The blacker it got, the more sinful it became. Coffee tastes different around the world. I’ve had coffee in many a places, but have never found the rich smooth blend of South East Asian coffee. 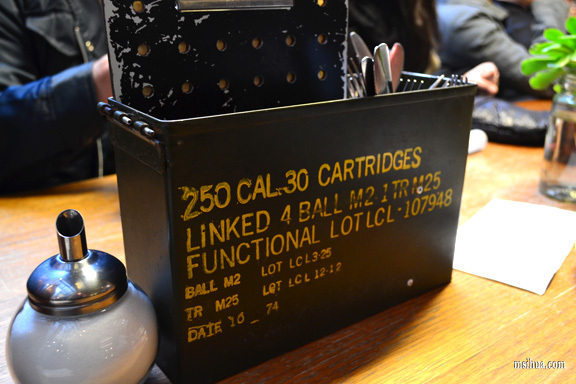 Especially those served in kopitiams in Malaysia or Singapore. Rich, black coffee beans, generally tossed in a big wok with butter or margarine and sugar to roast, bringing out that distinctive burnt flavour found in Malaysian or Singaporean kopi. 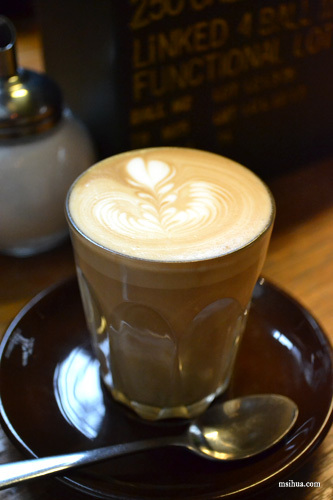 On the other hand, I find the coffees in Melbourne to be a stark contrast. 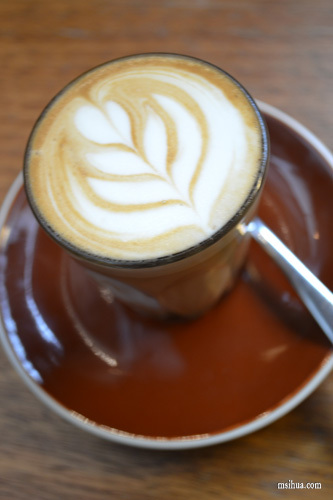 The coffees here are sweeter and cleaner in taste. It doesn’t have the sharp bitterness from the roasted coffee beans which I grew up with. But I love it just as much and embrace it altogether more as it signifies a different part of my life. 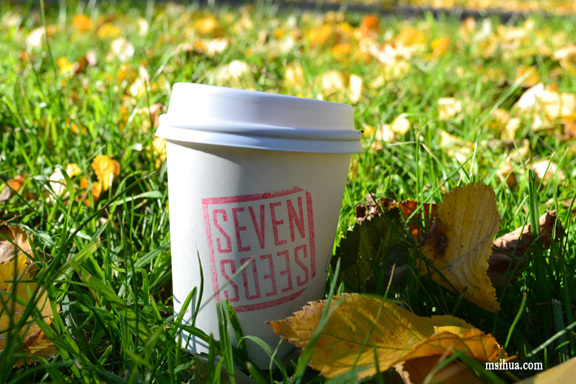 One of my favourite places to enjoy a good cup of coffee is at Seven Seeds. Now I’ve been here a few times, but I’d never had the opportunity to dine-in. One Sunday morning, the Boy decided to drop by as I was dying for some good quality coffee. 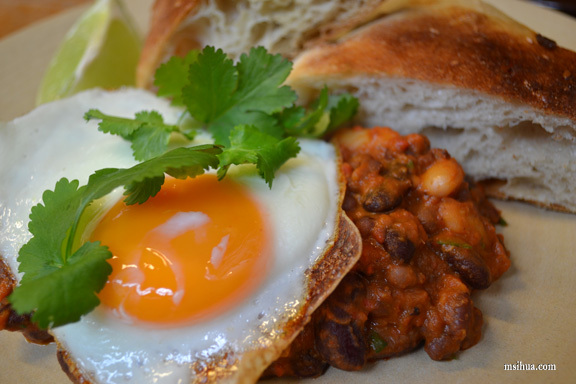 The Boy ordered the 7 Seeds Smoky Baked Beans, Fried Free Range Egg, Turkish Bread ($13.50) which he quite seem to enjoy. 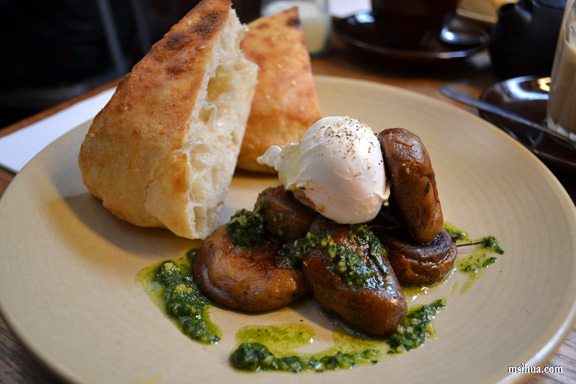 Whilst I ordered the Sautéed Mixed Mushrooms, Basil & Pinenut Pesto, Poached Free Range Egg, and Turkish Bread ($13.50). I love mushrooms and this dish was just delicious. It reminded me of the earthy forest floor. Quite amazingly, with those mushrooms, I very nearly forgot that I was eating a vegetarian breakfast, with no bacon! So what did I think of their breakfasts? Pretty simple fare, nothing overly complicated on their menu. I would probably dine-in again if seats/tables were available immediately. Service tended to be a little slow at times, but it was understandable with the incredible amount of people walking in (we were there on a weekend morning). Some folks sitting with us at the giant communal table were lamenting that some of their favourite items on their menu had disappeared (I think it was something to do with the French Toast, but don’t quote me on that). However, I was happy enough with my mushrooms and coffee and didn’t really bother much about what I was potentially missing out on. In terms of their coffee, it’s pretty much a no brainer there. 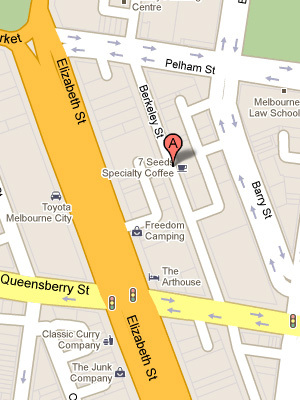 It’s easy to see why they recently won the Best Coffee Award from The Age Good Cafe Guide 2011. My most memorable cup of coffee was within these walls. That was about a year ago. =) But on my last visit, twas still good, but I didn’t have as mind blowing an experience with the coffees as last year. I love the sandwiches here!!!! Aww thanks! How can you possible not like coffee?? Come with Bryan and I.. between us the other day we had 4 coffees and 1 chai 🙂 Practically bouncing off the walls! I just had a chai latte there last week :). Such the uni student hipster place to be :D.
u mean they havent taken away the french toast!!!? thats the bomb dish to have. remember having it twice. I’m not sure.. oopps… note I only overhead this, but it sounded as if they replaced the main parts of the serve? So the toast remains, but the sides have changed? Maybe? Aww.. thank you! I know! You people at Melb Uni are so lucky… I remember we hardly had any good things over at Monash… Now I want to try soy piccolos!!! AR yes… the good old kopitiam coffees. I like them but it seems my tastebuds have changed over the years. I miss latte when I go back to SG. I’m always up for some good kopitiam coffee!! I can’t even find the right words to describe my sinful addiction to caffeine. I never liked pure black coffee, though. I agree with you when you said that Southeast Asian coffee just have this special taste, you know – something you can never forget. I honestly like the way you are writing. It feels so light and I know that I’m in for some entertainment. Now that I’ve already bookmarked your site, I could get my daily dose of entertainment and well, envy with those restaurants you visit and food you eat. And i think the part where you said you can “potentially get away with murder” because you’re kind of spoiled with your grandparents has some truth behind it! The way I see it, grandparents have this way of loving their grandchildren more than they love their own sons and daughters. But that’s just a theory so don’t think about what I said, lol. Hi Jenna! Thanks for that.. about the getting away with murder.. probably doesn’t stand anymore 😛 Now I get nagged on marriage and kids.. Meh! Haahahhaha…I need to find me some good black coffee from Malaysia!!! Reading your blog post made me crave for coffee. 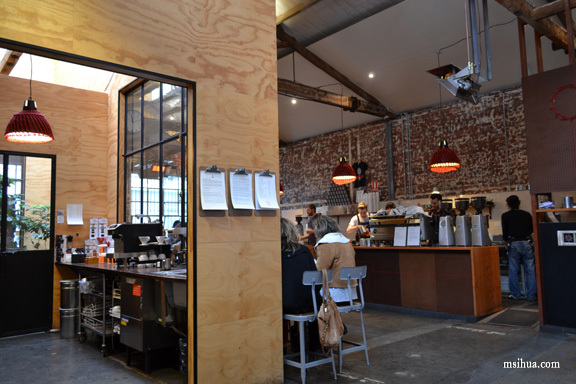 Now i seriously have to go and try Seven Seeds out…my friends have been raving about it, but I’ve never got a chance to plus I moved here not long ago…found that there are lots of places for me to explore! Great review! I really like this place, too, but haven’t eaten there yet (I get a little distracted by my caffeine addiction). Those baked beans look hella good, I haven’t had them in ages. Great excuse to go back.